Finally I paid a visit to The Glamourous Factory, Plaza Singapura outlet last month, it has been more than a year I didn’t beautify my nails. I have been looking forward to the appointment ever since I attended the “The Glamourous Factory Nail Art Workshop” Event in May. After seeing the wonders and the amazing colours of BUB AI Professional Nail System at the event, I really can’t wait to have it on my nails. Glamourous Factory is apopular home-grown full-service beauty parlour brand providing nails, facial and waxing services.Tucked at hideaway locations, there are three Glamourous Factory boutiques around the island: The Clift (McCallum Street), Plaza Singapura and Roxy Square II. Set up to glamourize the working executives, the salon’s loyalists also include local mediacorp artistes Chen Liping, Yahui and actress Dawn Yeoh.Founded in 2012, the salon brand was created to reach out to the busy woman on-the-go, the parlour’s beauty services include the international renowned skincare brand, Guinot’s five-star signature facial treatments, waxing, permanent hair removal (with Energist Ultra VPL) and eyebrow shaping, embroidery and eyelash perming. One of Singapore’s best kept beauty secret to-date, The Glamourous Factory boasts a loyal following for its creative nails services, as well as their efficient zip & go speed. In June 2015, the salon will be the first to launch the renowned Korean brand Bub’s AI range of professional nail products. Yee Sin, the co-founder and the head nail artisan of The Glamourous Factory personally did the service for me. Yee Sin was specially trained in Korea by Mdm Shigeyama Ai to be the first Nail Educator and trainer for the BUB AI Nail System in Singapore. I’m clueless on what to have on my nails so she showed me the designs that uses BUB AI range. The Glamourous Factory is currently having promotion for the designs below. 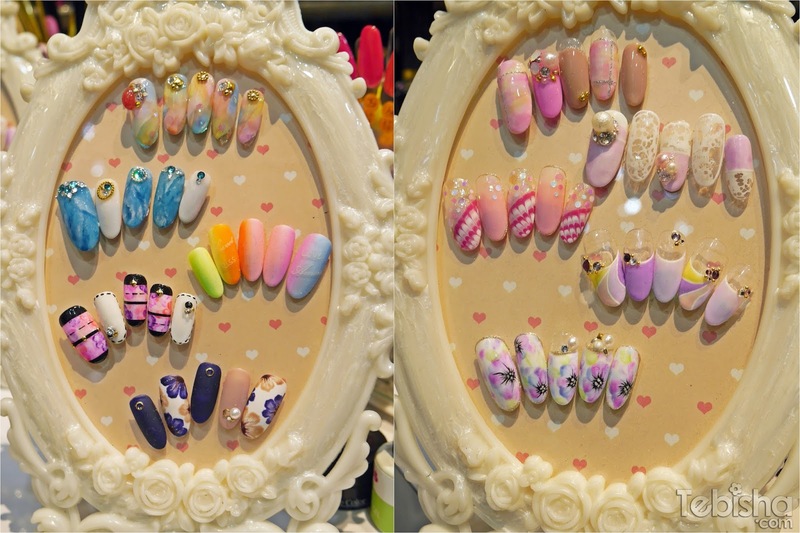 You can have these BUB AI nail collections on your nails for $50 only! (usual price $160 onwards.)! I love pastel colours and wanted to have a set of colourful nails, one of the designs caught my eyes and decided to have it on my nails. Read till the end for my nails design! Nail Artisans of The Glamourous Factory use the whole range of BUB AI products from nail tools to nail colours! Whenever the manicurist need to remove our cuticles, we have to soak my hands in water in order to soften the cuticles. But by using BUB AI nail tools, cuticles are able to remove it cleanly and effectively without soaking our hands in water. Pros: No messiness and water dripping on the table. Manicurist do not need to prepare extra towels to wipe dry our hands. And its more hygienic for not using the manicure bowl. Yee Sin did not use nail file to file off the top layers of my nails, nail file is only used for shaping the nail shape. She used BUB AI soft nail buffer to buff off the remaining cuticles and smoothen my nails. The BUB AI tools are safe and gentle to nails. I told Yee Sin, I don’t want to have too much crystals on my nails as I afraid it will bring inconvenience to my daily life. But Yee Sin proved me wrong. BUB AI Bijou Gel and Clear Gel are specially formulated to be used for sealing the nail crystals and decorations. You can see from the picture below, the crystals and decorations were being sealed inside the clear gel. This is to prevent the crystal from coming off, it really lasted till the the day I removed my nail art. And never worry about washing our hair, the crystal will not pull or tangle our hairs while washing. I’m impressed by BUB AI products, Yee Sin’s skills and her passion in nail industry! Thanks Yee Sin for the effort. Like & Follow The Glamourous Factory FB https://www.facebook.com/theglamourousfactory and instagram https://instagram.com/theGlamourousFactory for updates, promotions and info.